IT’S HERE!!! Tomorrow is officially day 1 of the Love Your Body Series 💜✨ If you haven’t yet, make sure you sign up here to join us for the ultimate self-care series ~ 8 weeks of toning workouts and energizing superfood recipes that leave your body feeling amazing! Today is your day to get all prepped and ready to go! I’m planning out my week of workouts and scheduling my classes in the Studio Tone It Up app. Aim to sign up for 3-5 classes this week. There are so many incredible classes waiting for you, plus a new mindful mediation with Karena. We’re especially excited to share the new Total Body Love workout tomorrow. This was one of the first workouts I filmed after having Bella, and Karena and I had the best time doing this routine. You’re going to love it! And of course Sundays are for meal prep! This will set you up for success and it’s the biggest time saver. 🙌🏻 You can meal prep whenever you have time, whether that’s Sunday or mid-week ~ do what works for you! Right now I’m whipping up the Coconut Mango Mini Muffins from the new Love Your Body Meal Plan while Bella naps. They smell amazinggg! You can find the Meal Plan here if you haven’t grabbed yours yet! 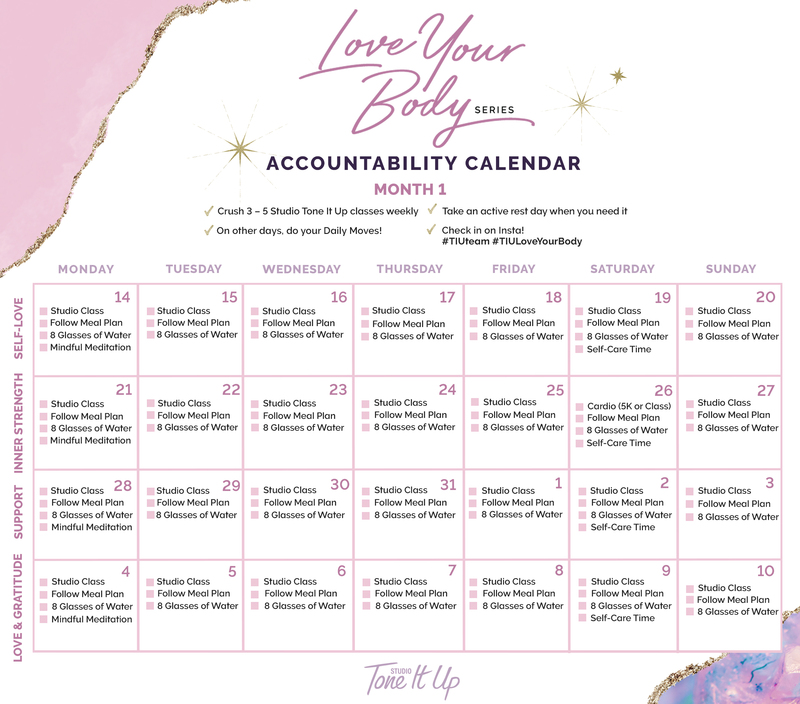 Karena and I also created an Accountability Calendar for you to keep track of all your goals. Print yours out below and hang it up somewhere you’ll see it every day! This is just the beginning of an incredible journey for you and this team. Let’s do this babe! PS: Yesterday I shared a video on Insta to kick off the series. It’s all about where I am right now in my journey because I want us to all to acknowledge and appreciate our bodies as they are right now, in this moment. Check out the video here and upload your own video on what you love about your body right now with the hashtag #TIULoveYourBody. I’ll be looking out for them! Remember you are beautiful, bold, and brilliant today and every day!